Wet and windy Another bumper attendance in the Lancastrian Suite of the Imperial Hotel ensured that the George Formby Society continues to enjoy a new found popularity with members old and new flocking to a very wet and windy Blackpool on Saturday for the June 2012 convention. 604 renamed This again had many notable moments but none more so than the re-naming of a Blackpool tram from plain old 604 to “George Formby OBE”. Sadly the weather was atrocious but it did not stop the hardy Formby fans from “having a bit of a do” up by the North Pier when TV producer/director Daniel Wiles performed the re- naming ceremony. Daniel was rightly selected after his two brilliant documentaries on George Formby, ‘Frank Skinner On George Formby’ and ‘The South Bank Show – George Formby’ are the two programs that will ensure that Daniel’s name will never be forgotten whenever Formby fans talk about TV highlights featuring their hero. The tram brought all the GFS fans back to the Imperial Hotel and they played their uke's all the way and actually managed to turn the rain cloud off with their ‘never say die” spirit. New members The weekend once again was one of top class entertainment with two cracking Formby films (No Limit and Come On George) thrown in for good measure. 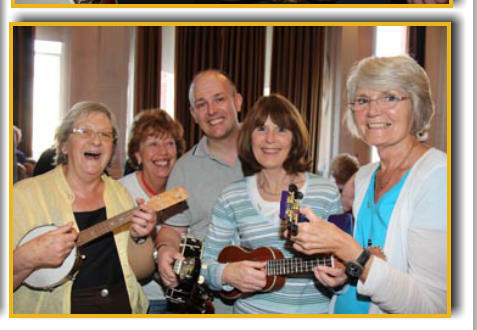 Many new members and some on the stage for the first time and they especially gave excellent displays of ukulele skill and good stage craft (obviously some of them had been involved in Dennis Mitchell’s class on stage presentation). It is always nice to welcome lady players and one new face who gave a very impressive performance was Caroline Robson when she entertained on Sunday evening, a really enjoyable performance. Saturday evening On Saturday evening Jonathan Baddeley produced a “Mr Wu” special when various members performed every Mr Wu song and Jonathan delivered an interesting history of the lovable Formby character. James Bassett led off and really brought the Eastern spirit in to the room as he was dressed in as good a Mr Wu costume as anyone has seen, George Formby would have been proud! James was followed by Mac McGee who also turned up as the famed Chinese chap. Dale Norman, Jonathan himself and Harrogate’s best, Tommy Bland ensured that Saturday evening got off to a top class start. Younger members Tommy along with young James, Ukulele Girl Francesca Davis and the brilliant Lewis Clifton are proof positive that this Society will thrive for many years to come, all of them are highly talented and have became firm favourites with the Blackpool audience. All the usual elements were in place with many hard working people donating a good part of their weekend to ensure that the quality of the meeting is maintained. 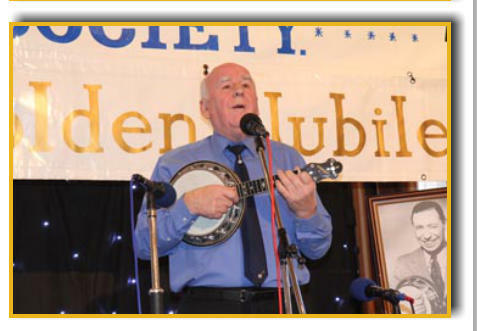 Sunday evening Sunday evenings used to be the quietest time of the weekend as many members would have returned home but again this weekend a good crowd stayed right until the end of the night and what a welcome sight to see Dickie Speake on stage playing his keyboard once again. This slot has usually ended up as a backing track session owing to the fact that regular keyboard player Matthew Richards has to return home – but now Dickie is available for Sunday evenings and the concert will be much the better for his attendance. So another very successful weekend in spite of the wet weather on the Saturday (ironically lovely summer weather on Sunday). 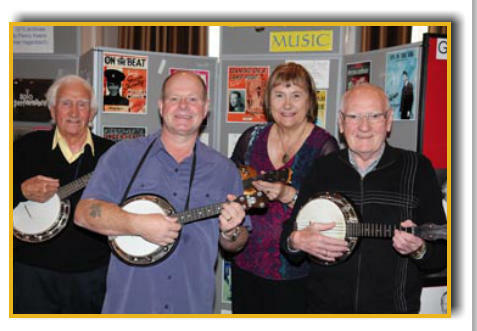 We start the 51st year at the September meeting and the GFS and its talented youth look to be on course to keep the name of George Formby and the ukulele in the public eye for many years to come. Wet and windy Another bumper attendance in the Lancastrian Suite of the Imperial Hotel ensured that the George Formby Society continues to enjoy a new found popularity with members old and new flocking to a very wet and windy Blackpool on Saturday for the June 2012 convention. 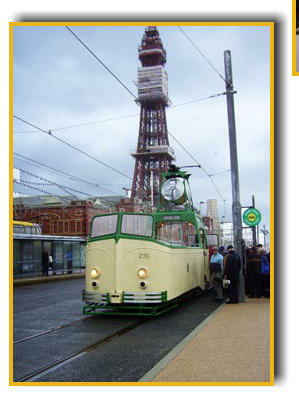 604 renamed This again had many notable moments but none more so than the re-naming of a Blackpool tram from plain old 604 to “George Formby OBE”. Sadly the weather was atrocious but it did not stop the hardy Formby fans from “having a bit of a do” up by the North Pier when TV producer/director Daniel Wiles performed the re- naming ceremony. Daniel was rightly selected after his two brilliant documentaries on George Formby, ‘Frank Skinner On George Formby’ and ‘The South Bank Show – George Formby’ are the two programs that will ensure that Daniel’s name will never be forgotten whenever Formby fans talk about TV highlights featuring their hero. The tram brought all the GFS fans back to the Imperial Hotel and they played their uke's all the way and actually managed to turn the rain cloud off with their ‘never say die” spirit. New members The weekend once again was one of top class entertainment with two cracking Formby films (No Limit and Come On George) thrown in for good measure. 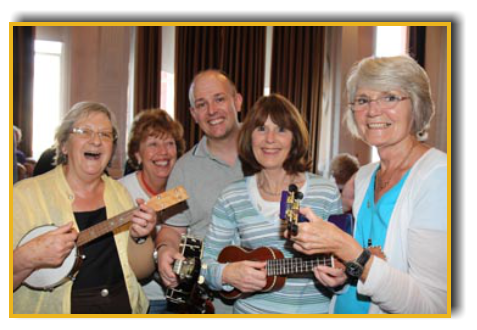 Many new members and some on the stage for the first time and they especially gave excellent displays of ukulele skill and good stage craft (obviously some of them had been involved in Dennis Mitchell’s class on stage presentation). It is always nice to welcome lady players and one new face who gave a very impressive performance was Caroline Robson when she entertained on Sunday evening, a really enjoyable performance. Saturday evening] On Saturday evening Jonathan Baddeley produced a “Mr Wu” special when various members performed every Mr Wu song and Jonathan delivered an interesting history of the lovable Formby character. James Bassett led off and really brought the Eastern spirit in to the room as he was dressed in as good a Mr Wu costume as anyone has seen, George Formby would have been proud! James was followed by Mac McGee who also turned up as the famed Chinese chap. Dale Norman, Jonathan himself and Harrogate’s best, Tommy Bland ensured that Saturday evening got off to a top class start. 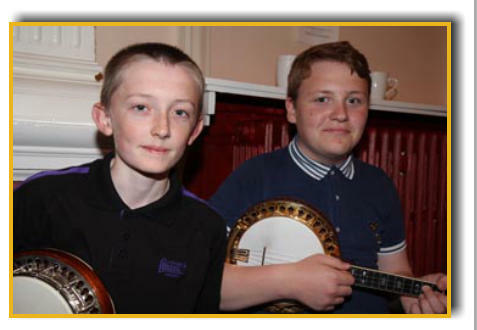 Younger members Tommy along with young James, Ukulele Girl Francesca Davis and the brilliant Lewis Clifton are proof positive that this Society will thrive for many years to come, all of them are highly talented and have became firm favourites with the Blackpool audience. All the usual elements were in place with many hard working people donating a good part of their weekend to ensure that the quality of the meeting is maintained. 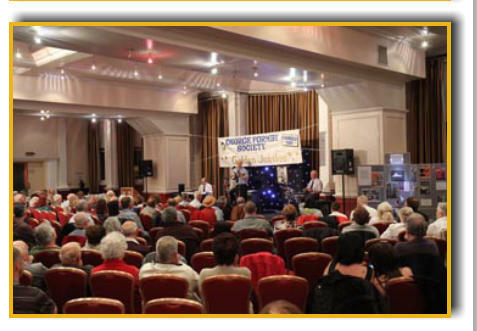 Sunday evening Sunday evenings used to be the quietest time of the weekend as many members would have returned home but again this weekend a good crowd stayed right until the end of the night and what a welcome sight to see Dickie Speake on stage playing his keyboard once again. This slot has usually ended up as a backing track session owing to the fact that regular keyboard player Matthew Richards has to return home – but now Dickie is available for Sunday evenings and the concert will be much the better for his attendance. So another very successful weekend in spite of the wet weather on the Saturday (ironically lovely summer weather on Sunday). 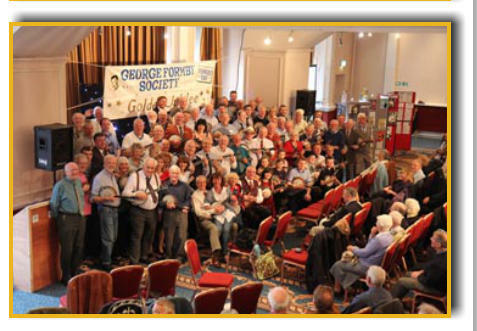 We start the 51st year at the September meeting and the GFS and its talented youth look to be on course to keep the name of George Formby and the ukulele in the public eye for many years to come.